Chicago’s rat problem has grown over the past few years, with complaints up in 2016. Though the mayor is working to address these issues, some residents are taking matters into their own hands. As a result, people are using working cats to combat the rat problem. The Cats at Work Project pits cats against rodents, providing a home for the cats and humanely eradicating rats. Through this program, felines are put to work by controlling the rat population through their presence and hunting. They are vaccinated and sterile, and often come from former life-threatening situations. This option allows the them to stay out of the shelter system while providing a rodent elimination service from their natural behavior. The felines will hunt the rat pests, not eat them, and keep your home and yard free of animal pests. There have been over 225 working cats successfully placed. Many who have used the program claim to see an immediate rat population decline within a week of having working cats. Some criticize the working cats method. Experts say that cats may reduce the number of rodents spotted, but not diminish the number of pests. Because of the cats’ presence, rats may behave more secretively. Experts suggest that there may not be concrete science to back up the eradication of rats due to cat presence. In addition, cats may cause harm to the bird population. They hunt rats, mice, birds, chipmunks and many other small animals. This means, a working cat likely will not discern between animals and target rats, specifically. Lastly, experts are concerned that cats could cause exposure to parasites through their feces. Consequently, the felines would become pests. Experts suggest limiting the rats’ access to food, water, and shelter. Rats can be tricky to remove though, and breed incredibly quickly to restore any population loss. If you are experiencing a rat problem, contact pest control to take care of the solution safely and effectively immediately. This entry was posted in Rats & Mice and tagged cats, cats at work project, cats eat rats, cats hunt rats, chicago cats at work, pest control, rat control, rats and cats, working cats, working cats project on June 23, 2016 by Attic Solutions. According to the Chicago Tribune, the amount of bats that have tested positive for rabies in Illinois is doubled comparatively to last year. Last year at this point, there were eight positive rabies tests. Currently there are 16. Though these numbers are small and it is early in the season, it could be indicative of a trend this year. Bats are found everywhere in the state, including the Chicagoland area. Rabid bats have been found in homes in Arlington Heights, Aurora, LaGrange, and Chicago’s south side. The family from Arlington Heights is pursuing rabies vaccinations. Most rabid bats found last year were in Cook and Will counties. Will county had a record setting 20 cases of bat rabies. Several species of bat are found in Illinois. Big brown bats and small brown bats are quite common, even in urban areas. Officials say that bats are common transmitters of rabies because they are often in contact with humans. Bats can also transmit rabies to other mammals like dogs, foxes, skunks, and raccoons. To avoid catching rabies, it’s advised to avoid contact with wild animals including stray cats and dogs. Especially avoid animals that are typically nocturnal but may be acting strangely during daylight hours. Do not leave food outside that may attract wild animals. Seal off any entry points to your home, or other buildings like sheds and garages, that wild animals may enter. Bats can enter through small entry pints near windows, attics, soffits, and spaces in your home’s siding. Keep your family pets’ vaccines up to date and do not let them roam without supervision. If you believe a rabid animal has bitten you, seek medical attention immediately. If there are animal pests on your property or in your home, call pest control to have them safely removed. This entry was posted in Bats and tagged Animal control, bat control, chicago bats, illinois bats, pest control, rabid bats, rabid chicago bats, rabies, rabies in bats, rabies in bats illinois on June 22, 2016 by Attic Solutions. There are four different species of squirrels that occur in Illinois. All of these mammals have long, bushy tails, long hind feet, and can be found in wooded areas. Illinois squirrels are found throughout the state, in wooded forest areas and urban areas. Deforestation and urbanization has diminished some of the squirrel population but they remain common. Fox squirrel: The fox squirrel is the largest species of tree squirrel native to North America. In Illinois, they are generally a brown gray or brown yellow color, with orange underside. They thrive in areas with trees that produce nuts. This species is spends more time on the ground than other types of squirrel. Fox squirrels are relatively solitary creatures and spend much time alone. Eastern gray squirrel: This tree squirrel is native to the eastern range of North America. These squirrels have mostly gray fur but white undersides. Occasionally black and white individuals can be found in urban areas within certain populations. The gray squirrel is crepuscular, meaning they’re most active during early and late hours of the day while avoiding middle of the day heat. Red squirrel: Red squirrels area sometimes referred to as chickarees. They can be found only in north Eastern part of the Illinois, especially near the Kankakee and Iroquois Rivers. This species prefers to eat the seeds of conifer cones. They are known for their smaller size, red fur and white underside. This species has a very high morality rate, as only about 22% reach one year of age. 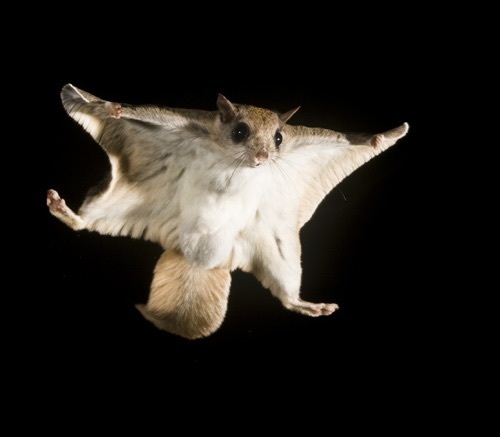 Southern flying squirrel: The southern flying squirrel is one of the only flying squirrel species found in North America. They are quite common in southern Illinois, but can be found statewide. They have brown gray fur and cream undersides. Their furry membrane that extends between front and rear legs allows them to glide through the air. These highly social squirrels have been known to forage for food and glide together in large groups. If any of these Illinois squirrels are making a home in your attic or other buildings on your property, do not hesitate to call animal control to remove them safely. This entry was posted in Squirrels and tagged illinois flying squirrel, illinois fox squirrel, illinois gray squirrel, illinois red squirrel, illinois squirrel removal, illinois squirrel species, illinois squirrels, pest control, squirrel control, squirrels on June 16, 2016 by Attic Solutions. 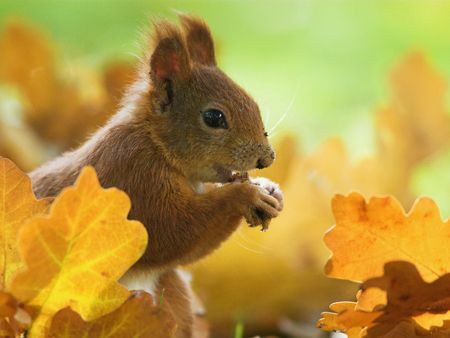 Squirrels are a pesky creature known for their bushy tails and nesting behavior. They often take residence in homes or outdoor building structures, causing trouble for homeowners. They may tear up insulation in an attic, use it for nesting material, chew through electrical wires, and cause damage to your home. Once squirrels have settled in your home, they can be quite difficult to remove. Follow these tricks to squirrel proof your home. 1. Repair damaged potential entry points to home like eaves, soffits, and roofing. Squirrels can scale trees easily and have excellent jumping skills, making few heights off limits. Any tiny home damage should be examined seriously and repaired quickly to prevent squirrel entry. 2. Use squirrel proof bird feeders. Squirrels love bird food and they can overrun your feeder, if it easy an easy source of food. Install standing bird feeders that are far from bushes and tree branches. 3. Install a chimney cap. Squirrels can enter chimneys if they are left open. Prevention is easier than removal! 4. Manage your trees and minimize squirrel likelihood. Trim your tree limbs so that they are at least eight feet from your home, to prevent them from jumping to your roof. Wrap a piece of sheet metal around your tree trunks about 6 feet up to prevent trees from climbing up. 5. Do not leave food sources outside. An obvious and simple fix, keep any pet or human food inside. Be sure to bring food and water dishes in at nighttime as well. Keep your garbage sealed tightly. If you discover squirrels in your home or infesting your property, call pest control to safely remove the pests. Attempting to do so on your own can result in more damage from the squirrels’ wily, erratic behavior. This entry was posted in Squirrels and tagged get rid of squirrels, pest control, prevent squirrels, remove squirrels from attic, remove squirrels from home, squirrel, squirrel pest control, squirrel proof home, squirrels on June 4, 2016 by Attic Solutions.